When you’re a new college graduate, mistakes can make or break your financial success right off the bat. 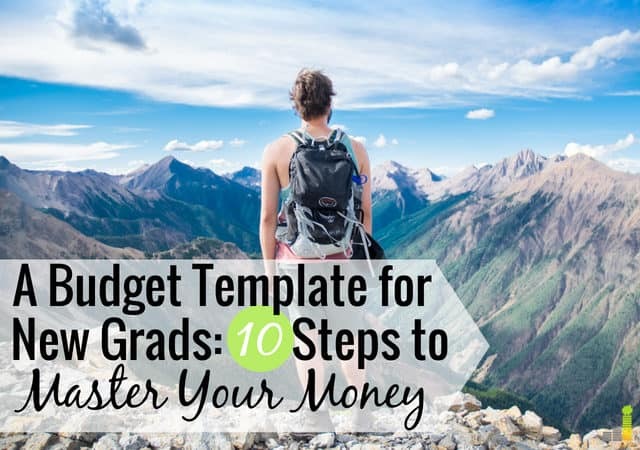 Following a budget template for new grads is a great way to get and stay on the right track. You don’t want to start off spending more than you earn only to end up living paycheck-to-paycheck, or worse, in debt. It can be difficult to anticipate what expenses you should budget for if you’ve never lived on your own. If you had few expenses in college, or your parents helped it can also be difficult. For example, even though I was tracking my expenses and income when I graduated, moving in with my then-boyfriend and figuring out a budget entailed more than I expected. I don’t think I’m alone in my experience. It’s easy to make financial mistakes in your 20s, but learning to manage your money wisely makes a difference. Many people find it difficult to start a budget, especially if they don’t know the recommended budget percentages by category. Thankfully, it doesn’t have to be that way. Below are ten things that should be in your first budget after graduating from college. Rent is a big expense, regardless of whether you choose to move out of your parents’ house or live with roommates. You want to focus on keeping this expense as low as possible while still living comfortably. Think of it this way – if 40 percent of your income is going toward rent and utilities, that doesn’t leave much room for anything else in your budget. When I first moved out, I looked for places with utilities included in the rent. That made my life a lot simpler when it came to budgeting as I didn’t have to worry about paying for my utilities each month. As you consider the expense of rent in the overall picture of your expenses you want to track your spending. Tracking your spending lets you stay on top of all your expenses by showing you where your money goes each month. This sounds difficult, but it’s actually quite simple – especially when you automate it. We recommend Tiller as a simple way to track your spending that lets you view all your financial transactions in one place. Tiller is a service that automatically pulls all your banking and financial transactions and puts it in a Google Sheet. The service goes categorizes your spending so you can find opportunities to save. Tiller is free to use for the first month, then $5 per month thereafter. Groceries are likely going to be your second largest variable expense. You have to eat, right? Yes, but that doesn’t mean you have to spend a lot on food. You don’t want to go overboard at the store only to throw out items because they’ve gone bad. That’s no different than throwing money in the trash. Everyone’s appetite is different, but my fiance and I hover around $300 per month for groceries. If I were budgeting just for myself, I’d probably spend $75-$100 per month, only because my appetite is small. Limit your trips to the store to help reduce opportunity to spend. Did you know you can also get cash back on your grocery shopping? With Ibotta you can earn cash back from items you buy at the grocery store. After you’re done shopping, you scan your receipt and Ibotta matches it against cheaper offers and pays you the difference. Ibotta connects to your PayPal or Venmo account so you can get paid right away. If you’d rather not scan receipts, you can use the Ibotta app on your phone to locate sales for the store you’re at. Ibotta gives you a $10 bonus just for signing up, and you can cash out once you hit $20. Here are some of the other best grocery rebate apps that give you cash back on your shopping. This one is a given, but that doesn’t mean you should exclude it from your new graduate budget. Most student loans give you a six month grace period upon graduation, so it’s important to come up with a plan to repay them during that time. It’s typically best to automate payments as most lenders offer a .25 percent reduction in your interest rate, helping save you on interest. You never want to be late on a payment, so it’s important to have the funds ready to cover your monthly debt payments. Doing so can help you pay off your student loans fast to become debt free as soon as possible. Do you have multiple loans, or high-interest rate loans? You may benefit from consolidating the loans so you only have one payment to make each month, and at a lower rate. Check rates at Credible to see how much you can save on payments. Credible lets you compare up to seven lenders at once and has rates as low as 2.54 percent on a variable loan. The average person saves almost $19,000 when they refinance with Credible, so it pays to check your rate. I prefer to keep this separate from utilities since your phone isn’t exactly a “living expense”. It’s still a big you must pay each month. It’s also probably one of the first bills you were responsible for paying yourself. It can be easy to fall into the trap of thinking you have to spend $100+ per month for your service, but you don’t. Cheap cell phone plans do exist that let you save big money each month without sacrificing on quality coverage. The key is to use a MVNO that piggybacks on someone else’s network. One MVNO example is Republic Wireless. Republic Wireless offers unlimited talk and text plans starting at $15 per month, with an additional $5 per GB per month if you want data. There are other similar carriers out there that, like Republic Wireless, let you save $50+ per month in this budget category. This might be a “boring” category, but you should include it if you have a renter’s insurance or car insurance. You likely will, so it’s important to include in your budget. Additionally, if you’re not covered by your parents’ health insurance, or you have any co-payments or exams that you need to pay for out-of-pocket, it’s a good idea to budget for them. Health insurance is obviously going to be the more expensive of the insurance needs. If you’re new to auto insurance, Esurance is a good option to compare rates. You should budget in your savings, otherwise you might not actually do it. When you allocate all your money and give it a purpose, it’s harder for things to fall through the cracks. The best way to begin saving money is to automate it, so you don’t forget to do it. The amount doesn’t matter in the beginning, you simply need to start saving on a regular basis. Barclays is a good option if you’re new to saving money. Barclays currently pays 2.20 percent on your cash (22x the national average) and has no minimum balance requirement. Give yourself a goal when you start saving. First you can work to save $500, then $1,000. You can use this as a foundation of an emergency fund as the unexpected will happen and you want to be prepared to handle whatever comes your way. If you’re able to land a job before you move out, I recommend moving as close to work as possible to cut down on transportation costs. Rent may be higher depending on where you work, but if you can get by without a car, the savings could make up for the increase in rent. Besides that, sitting in traffic isn’t fun. Can’t get anywhere without a car? Estimate how much you’ll spend in gas on your commute to work by using a trip cost calculator (Gasbuddy has one). Factor in any other errands you may run over the week, as well as any trips you want to take. Only spending on public transportation? Figure out how much monthly passes are and add it into your budget. If public transportation isn’t an option, consider completely getting rid of your car and use Lyft or Uber to get around town. Depending on where you will live it can be cheaper than owning a car, and an easy way to save money. Just make sure to do the math before making this decision. Contrary to what some might think, it is possible to enjoy life while living on a budget; you can even treat yourself when you look for ways to save money on entertainment. This is a very broad category that encompasses a lot of “fun” expenses. Most of these expenses aren’t needs, but wants. It’s a good idea to leave this category for last when figuring out how much money you can allocate to it in your budget. Remember how we were talking about savings? You need to take future veterinary expenses into account, too. None of us like to think about anything bad happening to our pets, but it’s better to be prepared for the expense with a dedicated pet savings fund. Some of these can be planned for (holidays, special events), and for others, you might need to adjust your spending elsewhere to make room. This is useful for those on an extremely tight budget who think they might encounter saving or debt fatigue. There’s only so much you can cut, and you never want to feel like you’re not allowed to have any fun. For that reason, having an “occasional splurge” category is a good idea. If you have any money leftover after budgeting for everything else, even $10, consider letting yourself use it for a fun splurge. $10 can get you a few coffee trips, a new top, an ebook or a used video game. It’ll give you a purchase to look forward to – just make sure it’s a good one! I want to make sure we’re clear here – budgeting, and being frugal, is not restrictive. In fact, both should give you freedom to spend according to what you want in life. The key is to be flexible and know what you value in life. If you want to have more entertainment money one month, you can “borrow” from your grocery budget. Staying aware of your expenses is the biggest key to avoiding financial stress. Managing money after graduating college does not have to be difficult. 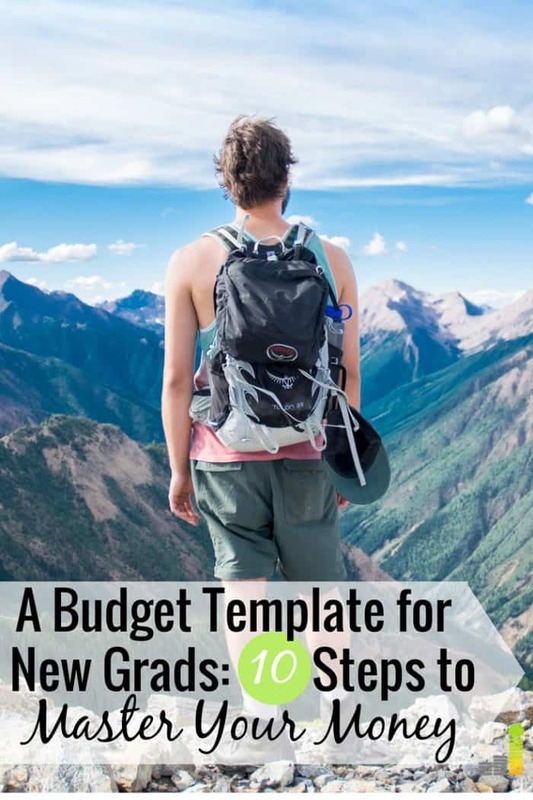 Following this sample budget for new college graduates is a great way to set yourself up for success and use money as a tool to get what you want in life. How did you approach budgeting when you were a new grad? Do you have any advice on how to manage money right out of college? What’s one fun category you like to include in your budget? These are great tips. After graduating, I found budgeting to be more difficult because for once I was no longer a poor college student. I was finally able to afford more but still wanted to keep myself in check. These are great areas to look at because they cover some of the most basic areas that most people will have expenses in. Lifestyle inflation is definitely really easy to succumb to after college, provided you can get a good paying job. It pays to have financial goals set up, too! I think a lot of budgeting in the beginning is trial and error. These categories are a great place to start, and then you can adjust accordingly based on your own needs / wants / lifestyle. Yes, it is! I had to make adjustments a lot, but having the basic foundation there can help keep things organized. I see a lot of people get trapped into the “I need to make rent” and then forget about everything else budget early on – they don’t realize that planning for everything will make every singular thing easier. Very true. Rent is a big deal, but far from the only one. You never want to get in over your head with rent and then not be able to afford to eat! They’re all pieces to the puzzle. I feel new grads should take things slow, and not rush into big purchases. Like a new car, just because they have a new job. Keeping things frugal in the beginning will go a long way to set someone up to retire sooner. The end goal is to have freedom so think in that aspect if your young. Agreed. Unless you’ve been saving and managing your money really well, buying a new car or a house so soon after graduating is just going to be financially overwhelming. It’s better to ease into things. Plus, your values are probably going to change! I know mine have. It would be a waste to spend so much only to regret it down the road. This is great advice! Budgeting has really changed my life and the way I view the world and my future. I think that it’s something that people should be doing while they’re in college. This can help them avoid falling into student loan debt or adopting lifestyles that are incompatible with their financial situations. Thanks, Monica! In a perfect world, I’d say budgeting is important as soon as you start earning money or have any expenses to take care of. I didn’t, only because my situation was fairly simple in college, but I still made sure to save. I really wish more financial literacy was taught in high school or college, though. Absolutely! Starting as early as possible is what needs to happen. We are the future, or current parents, of the next generation, and it’s up to us to lead by example now and teach these valuable life skills to young people from an early age. Great post, Erin. When I was a new college grad I really didn’t budget, and honestly can’t say I budget at this time, either. I think tracking your spending is an important first step for grads. If you know what you are spending it’s much easier to make adjustments. I definitely agree with that, and I’ve done the same. I had a spreadsheet set up to track spending, but I didn’t budget in the traditional sense. Just depends on how well you manage your money and what works for you! These are all great tips! When I graduated, I bought lots of clothes and shoes, even if I really don’t need it. Budgeting for me is really hard to do, but now I tried my very best to keep my spending low. That’s definitely another easy trap to fall into as you enter the workforce. I had to get dress clothes, but tried to do it as cheaply as possible. Good tips! I should’ve set up a budget when I was a new grad. If I had, I wouldn’t be in debt like I am today. Sigh! It’s tough because when you graduate, you have high hopes for the future and your earning ability. Unfortunately, reality doesn’t always cooperate! Great tips! It’s so important to set those savings goals right away. Whether you want a car, a vacation, a wedding, or just larger investment accounts, getting into the savings mindset is well worth it. Yes, it’s all about the mindset! That’s the hardest part. I grew up with my parents being in debt, and I could have easily fell into the mindset of “charge and pay later.” Thankfully I didn’t – it can be hard to get out of. Glad to hear it worked for you, Thomas! I try to save as much as possible so I’ve never tried it, but I’ve seen others struggle with saving when everything else is up in the air. Budgeting and getting organized helps. Entertainment is the last thing I spend on after saving some and paying my bills. I think this kind of expenses is the one I can really sacrifice such as gym membership. There are lots of videos online on exercises that use body weight and no equipment.